ETSU had many things to offer Mike Williams when he came from Mt. Laurel, New Jersey, but it was nothing compared to what he could offer ETSU. 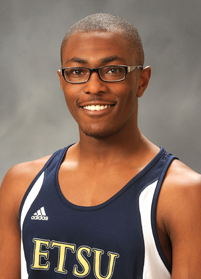 Williams committed to ETSU two years ago as a freshman because of the Division 1 track and field team, as well as the digital media and game design major. Most schools on the East Coast were not able to offer him both of what he wanted, so he chose to come to Johnson City. In high school, Williams competed in track and field all four years, primarily in the 100 meter hurdles, 400 meter hurdles and 400 meter events. Since coming to ETSU, he has continued to shine in the events he knows best, as well as figuring out other areas he can excel in the sport. During his freshman year, he was part of a 4×4 relay team that placed first in the A-Sun Indoor Championship, as well as placing second in the indoor championship for the 400 meter hurdles. He placed second again in the A-Sun Outdoor Championship 400 meter hurdles. He barely missed the mark for first place, which he felt like he should have won. The next year, he made sure he wouldn’t come in second again. He won the SoCon Outdoor Championship in the 400 meter hurdles with a personal best time of 52.03. As his junior track season comes to an end, Williams is looking for another win in the outdoor 400-meter hurdle event, but he is also looking to capitalize on what he learned in the 60-meter hurdle indoor event. He is ultimately preparing to run faster times that will get him to the national meet. Williams has never played another sport and thoroughly enjoys all that track and field gives him. He takes pride in the fact that it isn’t a skill sport, but rather an ability sport left solely up to the person playing. “The only way to really improve is to keep pushing harder, and the better you get, that’s your body having the ability to go faster,” Williams said. Williams is rewarded every day that he makes a new accomplishment with his body. Being able to see the changes and see how he improves is what keeps him running and keeps him focused. He is motivated to keep running faster and continues to strive for that top spot in the country as one of the best hurdlers.